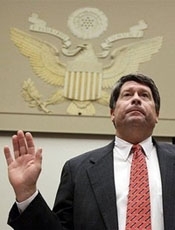 FEBRUARY 11--Despite a history of positive salmonella tests, the head of the embattled Peanut Corporation of America (PCA) last month sent an e-mail to company executives claiming that previous lab testing had 'never found any salmonella at all' in the firm's products. In a January 12 e-mail, a copy of which you'll find here, Stewart Parnell, PCA's chief executive, denied that the discovery of salmonella in the kitchen of a Minnesota nursing home was connected to the Virginia-based company, which is now at the center of a national salmonella outbreak that has resulted in nine deaths and the sickening of at least 600 consumers. 'We suspect the salmonella could have been introduced by cross-contamination after the tub was opened,' Parnell claimed.